A moment of pause is difficult to find in New York City. However, here and there, a park can offer a bit of respite from buildings and cars. 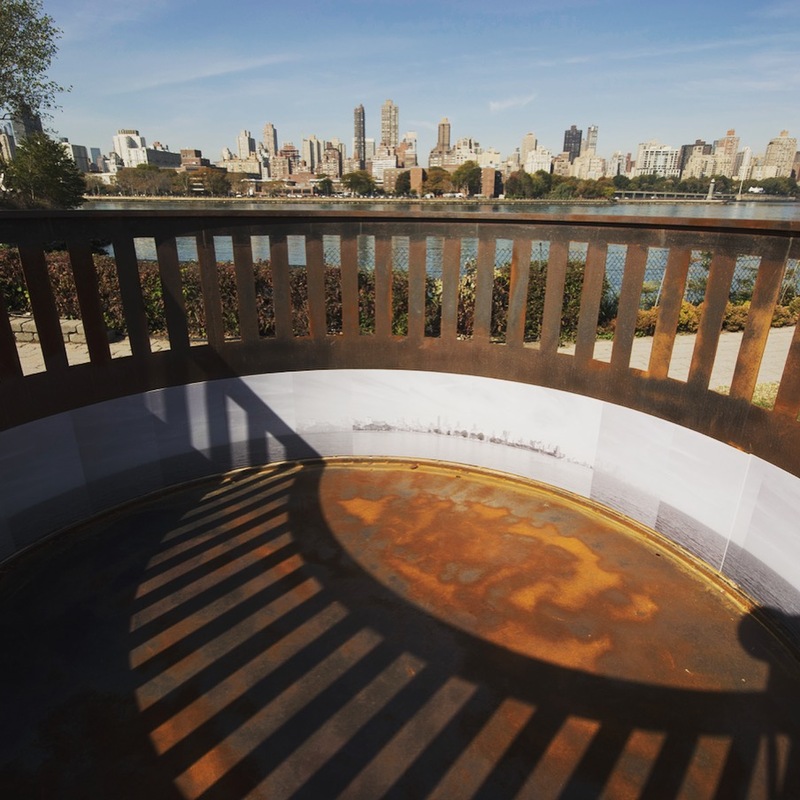 2015 Emerging Artist Fellow Freya Powell draws from this special relationship between parks and visitors in her piece Active Turn, a zoetrope installed at the edge of Socrates Sculpture Park’s waterfront. Her interactive work invites visitors to spin it around, revealing images of Manhattan’s skyline transitioning to the ocean’s open horizon and back again. Despite echoing the cityscape that stands behind it, Active Turn becomes its own entity: it creates an introspective atmosphere, one in which an individual can escape from busy surroundings. In 2011 Powell visited the South Eastern coast of England, where she first encountered the English Sound Mirrors. Sometimes known as acoustic mirrors, these giant concrete structures were built during World War I before the invention of radar. Their purpose was to aid in the detection of battle ships approaching from beyond the horizon line. At nearly fifteen feet in height, they stand at the water’s edge, teetering between land and sea, the known and unknown. With the English countryside surrounding them, the mirrors are haunting in their obsoleteness, yet beautiful in their withstanding of time. In response to her experience with the structures, she produced Diminishing Distance (2013), for which she recorded the sounds that were collected by these sculptures. Since then, she has continued to explore the question we all sometimes ask: what lies beyond the horizon? Ocean horizons are not the only kind that Powell explores. In a 2015 photo series, Morning Light, she looks to a different kind of horizon–one that involves wondering what lies beyond silhouettes. In her photos, Powell captures the dreamy effects of shadows and reflections that are cast by windows in the morning sunlight. This fall, Powell will be engaged in several projects in addition to her piece at Socrates. She is launching an artist book entitled Mnemosyne Atlas (2014), an intimate collection of 60 individuals’ memories of 2014, as seen through texts and images that they have contributed to the artist. Afterwards, she will be casting two hands holding each other in graphite to create a series of memorial pieces for friends she has lost throughout the years. At the moment she is beginning research for a sound piece that will use the structure of a Sophoclean chorus to communicate an elegy.